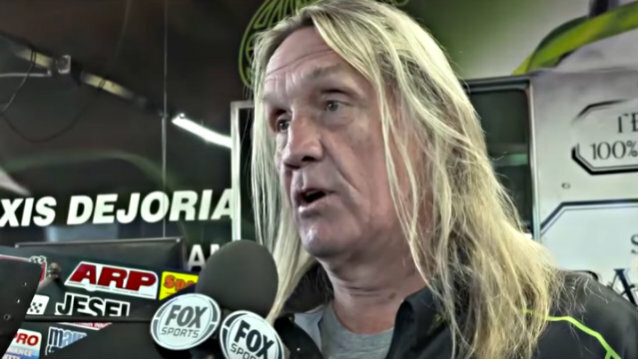 IRON MAIDEN drummer Nicko McBrain made a trip to the 2017 Amalie Oil NHRA Gatornationals at Gainesville Raceway to visit Funny Car driver Alexis DeJoria and get his Nitro Fix prior to the team's first test run. NHRA reporter Lewis Bloom spoke to McBrain at the event and filed the report below. McBrain is a huge fan of Tony Schumacher, Ron Capps, and, of course, DeJoria. He was thrilled to sit behind a 10,000-horsepower nitro-burning engine for the pre-run engine warm-up. As thrilled as he was, so was DeJoria, who is huge fan of MAIDEN and music in general. She even mentioned she took her children to their first concert and, as it should be, it was IRON MAIDEN. IRON MAIDEN's "The Book Of Souls" tour resumes with a series of arena shows opening in Sportpalais, Antwerp, Belgium on April 22 and continuing into Germany, U.K. and Ireland, finishing with two sold-out shows at London's 02 arena on May 27 and May 28. The band then flies to the U.S.A for an extensive series of arena and amphitheater shows, including dates in Canada, ending with two nights in Brooklyn, New York on July 21 and July 22. This is the final leg of "The Book Of Souls" tour.